Alderac Entertainment Group (AEG) released their 2012 game Trains to critical acclaim. Their 2014 release Planes got a less than stellar reception, but eyebrows were raised at the names and design similarities between the two games. Questions were asked, people wondered if AEG was really planning on pulling off the longest joke setup in board game history. When Automobiles was released in 2016, AEG proved that they had the gumption to make the joke trifecta. Now they just had to prove that the game was good. Big reveal: Automobiles is no joke. This game is fantastic! 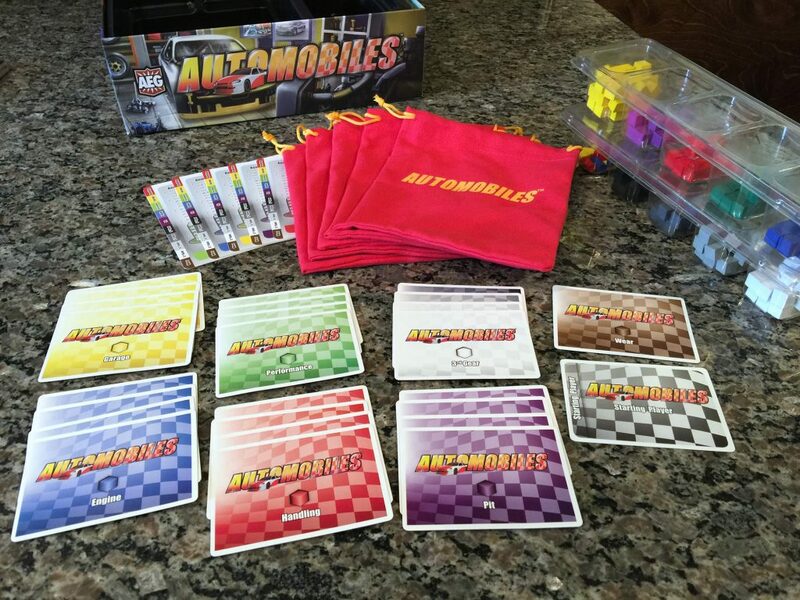 Automobiles is a variation on a style of game called “deck-building“. Each player starts with identical decks of cards and can customize those decks throughout the game. By the end of the game, each player has a completely unique deck which allows each player to play the game differently. That’s right Elijah, in the case of Automobiles, the cards are cubes, and the “deck” is an attractive bag. 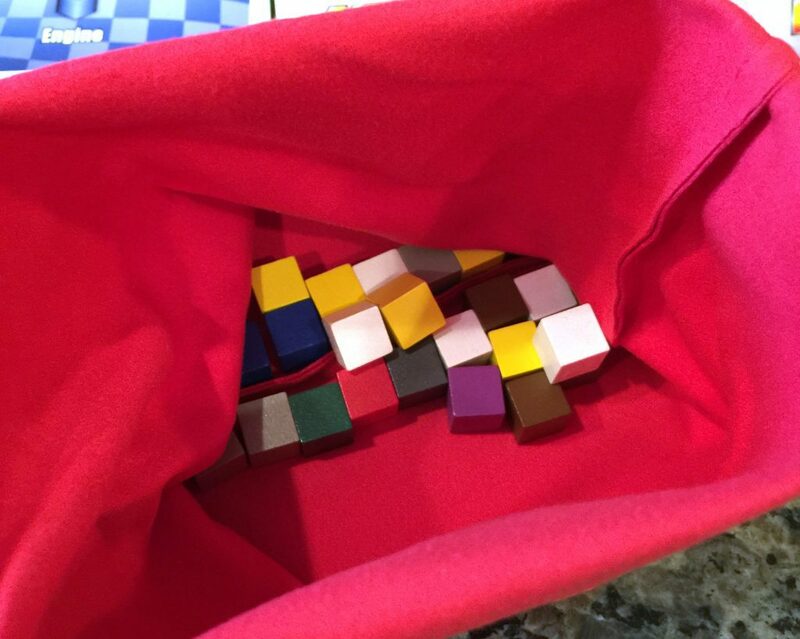 Toss your cubes in the bag, draw 7 out at the beginning of your turn, and you’re off to the races. Literally. One player might want to focus on speed, while another player wants to recycle his cubes faster, and yet another player just wants to earn more money. 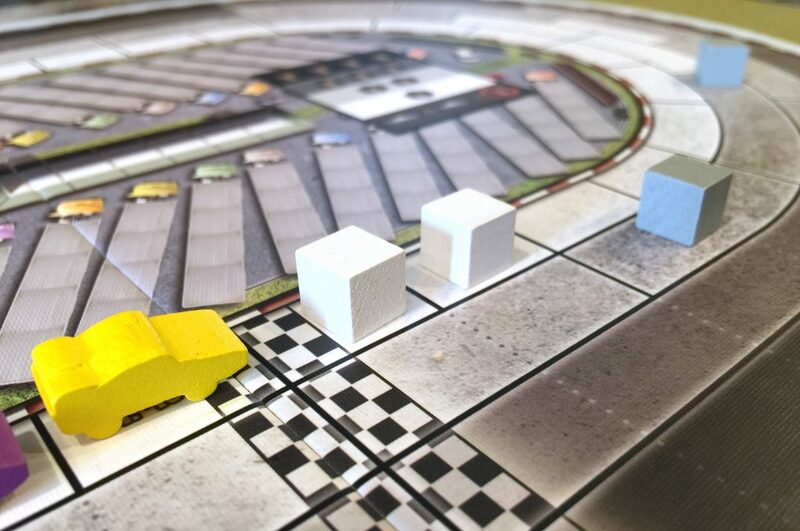 Players use these cubes to move around the track, manage their vehicle, and as currency to purchase newer and more expensive abilities. 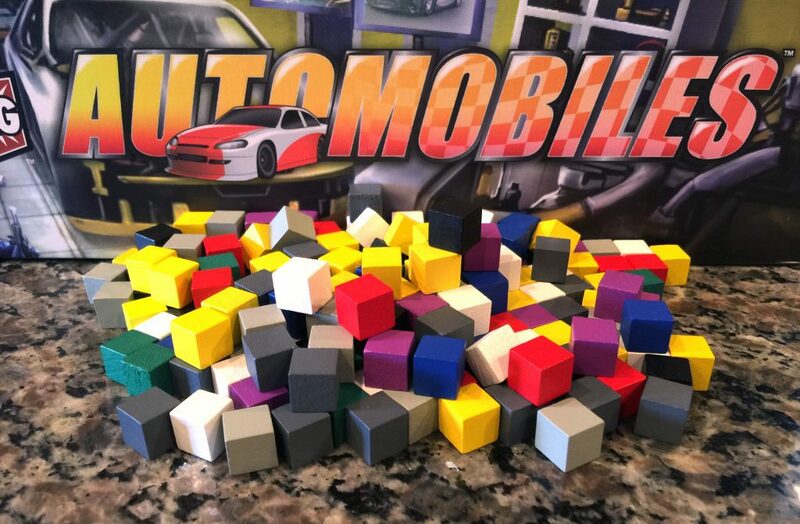 AEG provided a lot of setup variety in the game by including 4 different cards for each cube color in the game: green, red, yellow, blue, and purple. Each card gives definition for that color for the entire game, providing a unique gaming experience. 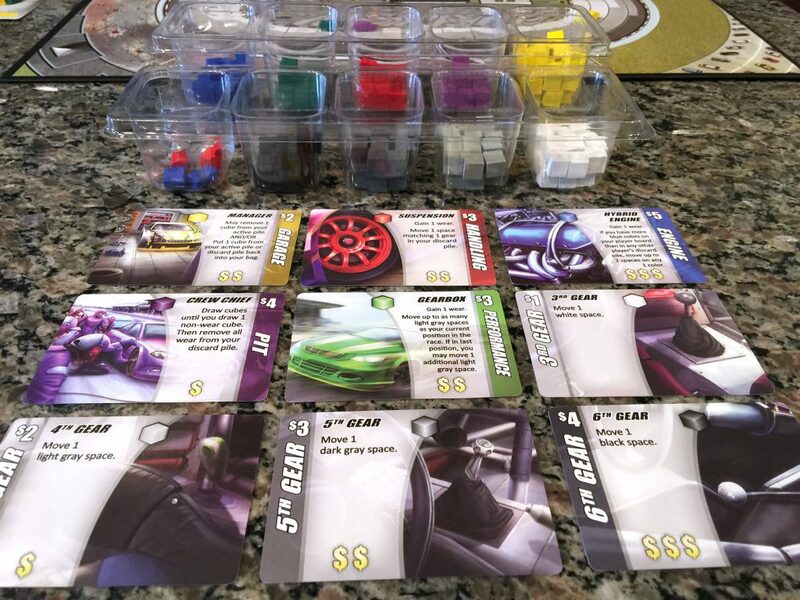 The player that can best manage their cubes, and their bag, is destined for glory, while the other players will be left coughing exhaust fumes and worrying if their racer is headed for an early retirement. Automobiles setup is fairly simple but offers a number of choices. 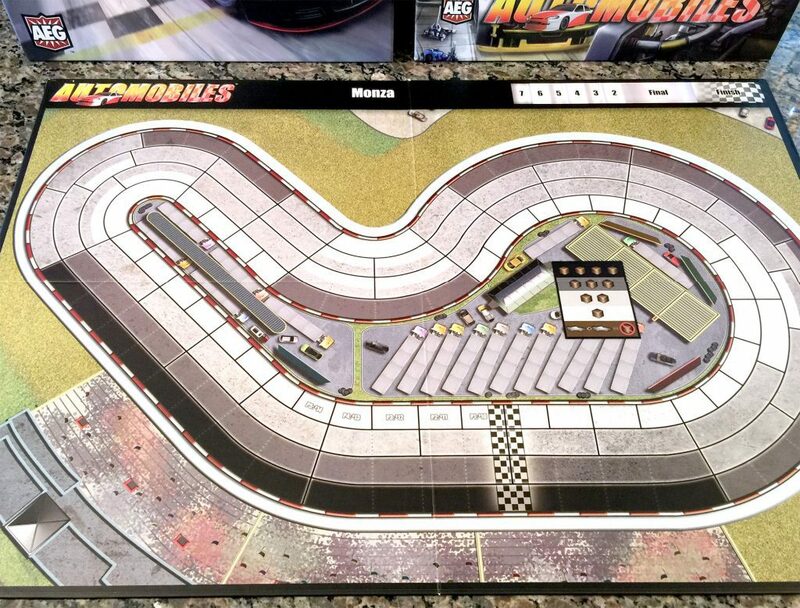 Players will select a color and take the accompanying car, lap marker, and player mat. 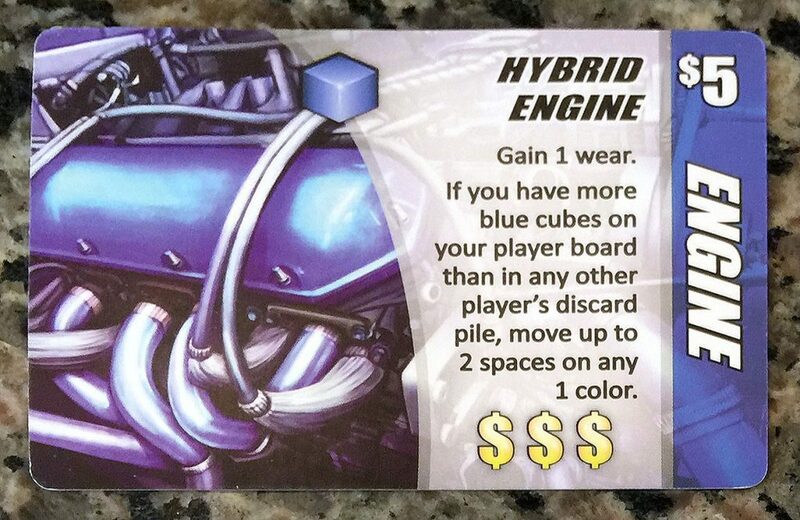 In addition to the cards for the colored cubes, there are cards for 3rd, 4th, 5th, and 6th gear which are used in every game. AEG did a great job with setup variability. That means the game plays differently if you provide different starting conditions. 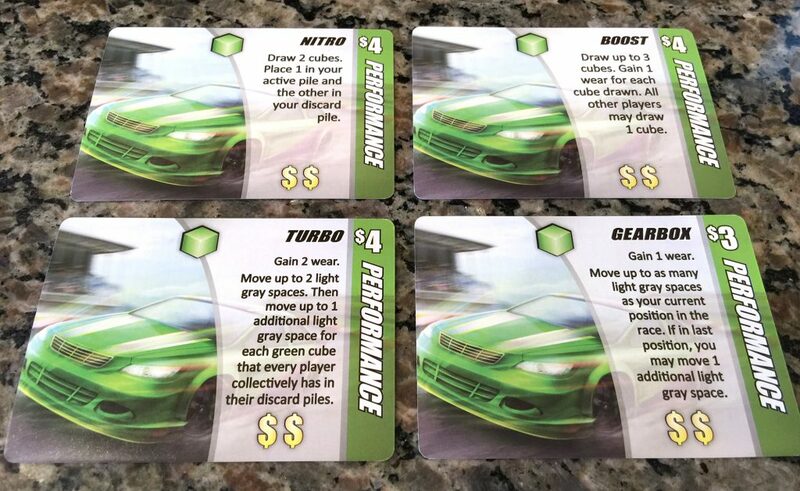 By offering 4 different ability cards per cube color Automobiles has over 100 combinations of upgrades. 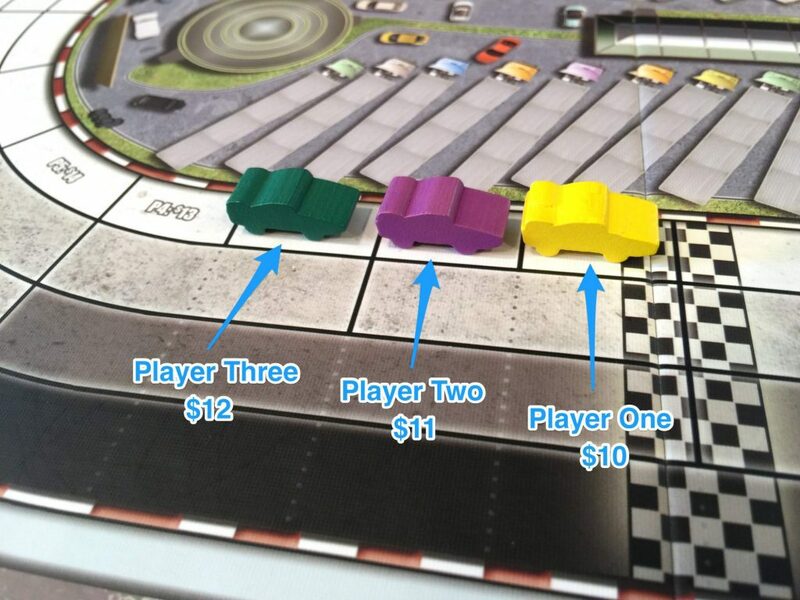 Randomly select player order, then place each car on the board in their player spots. Finally, each player receives a starting income as shown under their starting position. Player One receives $10, Player Two receives $11, and so on. 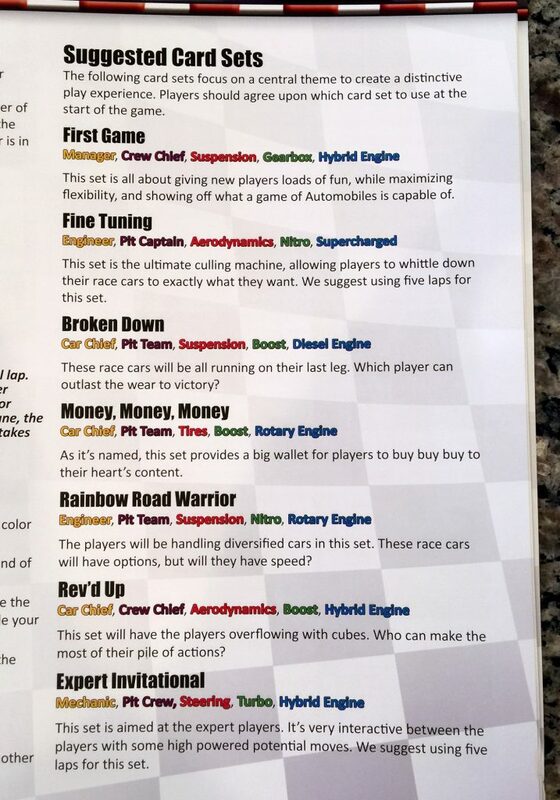 Players use that starting income to purchase upgrades from the market which will begin to make their racing team unique. Andy, let me step in for a quick note about upgrades. In most deck building games you don’t get the chance to purchase upgrades until your first turn. 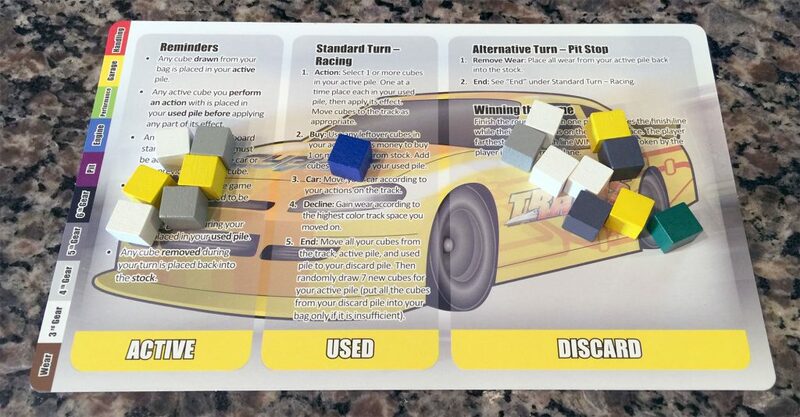 Automobiles takes a unique, and welcome, approach by letting you customize your racer before the game even begins. At the top of the card is the title, and special ability text. The number in the top right corner is the cost you must pay to purchase a cube of this color. The dollar signs at the bottom of the card indicate the monetary value of this cube when used to purchase upgrades. Thanks Elijah, that’s an important thing to to remember as you work your way through the game. Knowing what upgrades to purchase, and when, can make or break your game. Moving around the track is exciting, puzzly, and all about optimization. Cars must always move forward (including diagonally) and can only move into adjacent spaces. Consider the yellow player below. Included in their bag pull were two white cubes, and two light gray cubes. 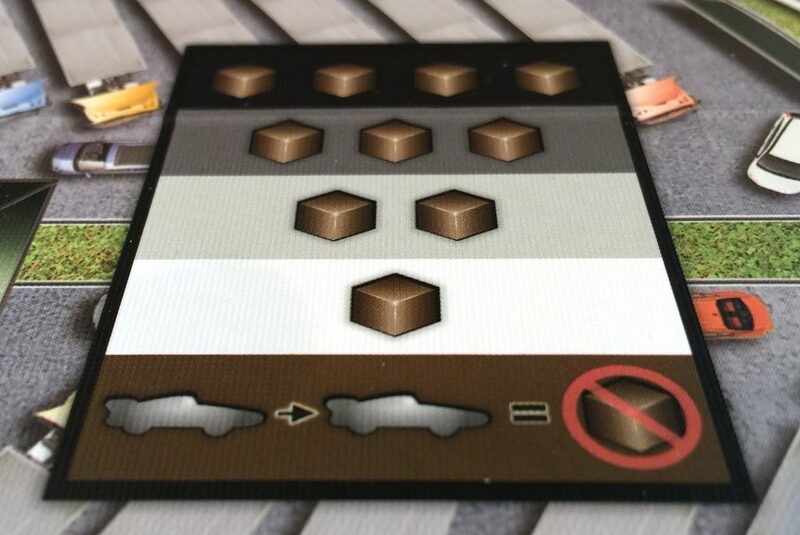 One of my favorite things about games of Automobiles is the excitement that all players get when one player sets up a great sequence of moves. In fact, in most games other players actively offer suggestions about possible movement solutions. 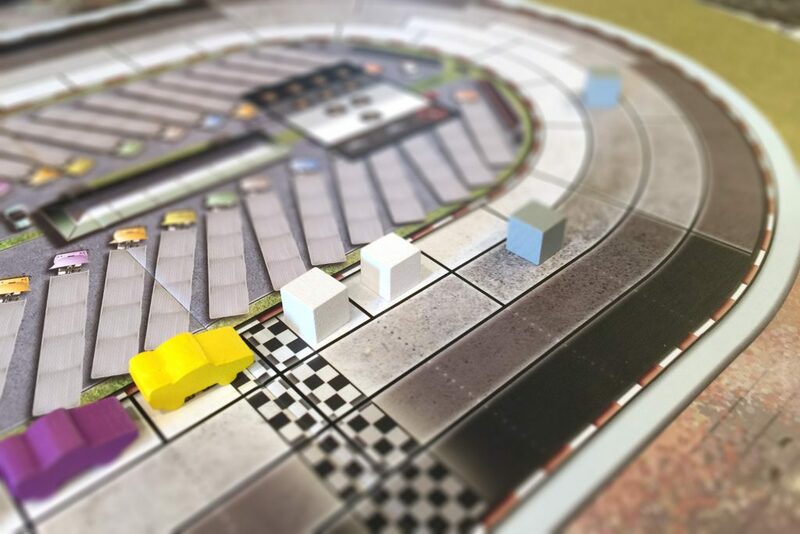 Even though it might cost you the game, watching a player literally go around the entire track in a single turn is thrilling! Move up to as many light gray spaces as your current position in the race. If in last position, you may move an additional light gray space. Any drivers finishing their turn in the space directly behind another driver will draft the driver in front and will not earn any wear. Knowing when to cut a movement sequence short to draft another driver can be key to a win. Yes, you might sacrifice one or two spaces, but coming off the use of a black space will prevent you from taking 4 wear cubes. Wear is the bane of any driver, real or cardboard. It clogs up your bag, and can really slow you down. You’ll always add wear cubes to your discard pile based on the “fastest” section of track you’ve been on during your turn. Additionally most green, red, or blue cubes require you to add wear if you use them for their special ability. Purple cubes are the primary way you’ll manage wear. 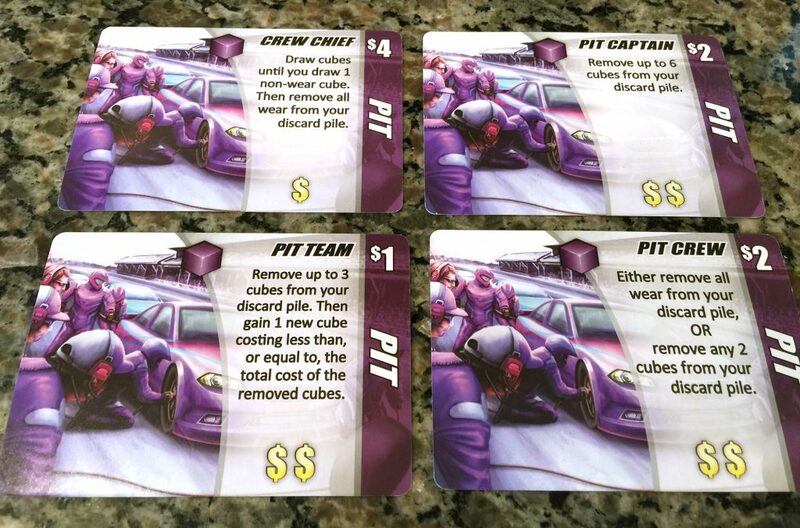 Cards like the Crew Chief not only let you draw more cubes into your current turn but they can also let you discard massive amounts of wear cubes from your discard pile. Timed properly, this can mean a huge performance improvement. Winning a game of Automobiles is quite satisfying. Even though bag draws introduce a lot of randomization, it’s mostly within your control. Clever use of upgrade abilities, maximizing your paths around the track, and managing your wear will give you a leg up on your opponents. I’m not a NASCAR fan…there I said it. I’m not even really a “car guy”. 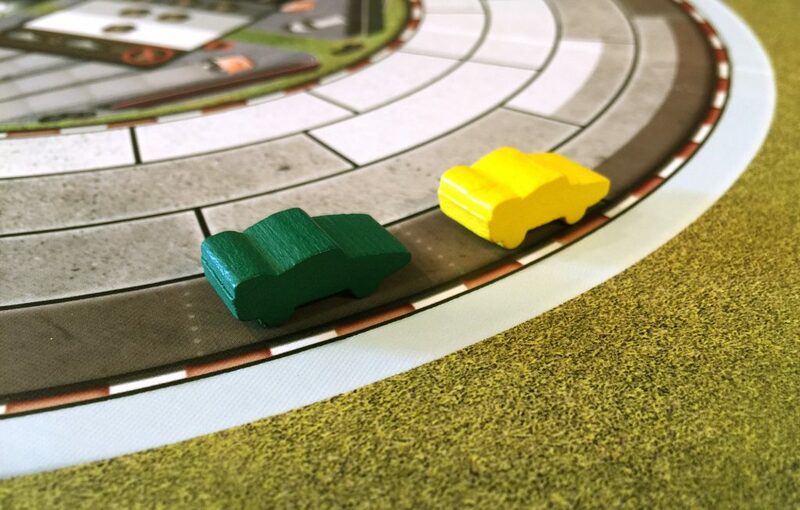 Games about racing don’t particularly attract me, but something about Automobiles was different. The art was great and the gameplay looked really appealing. After my first play I knew I was hooked. 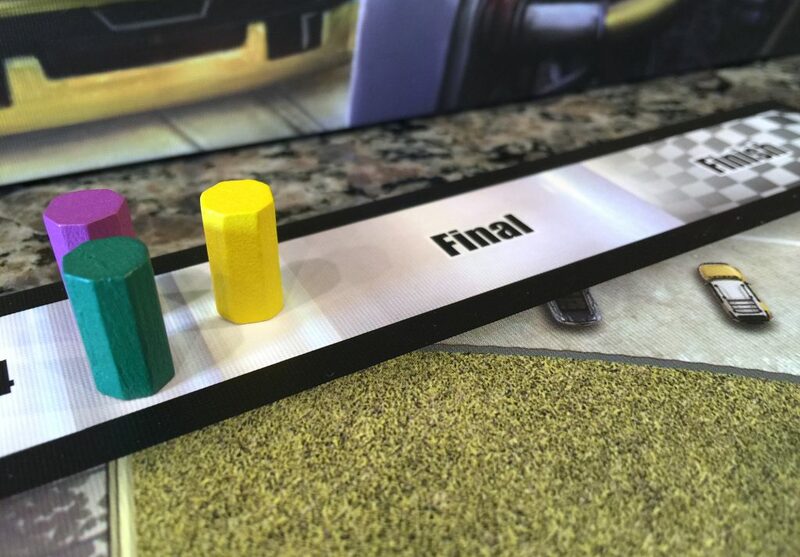 The components are really high quality, with thick cards, large heavy cubes, and a sturdy, double-sided game board. 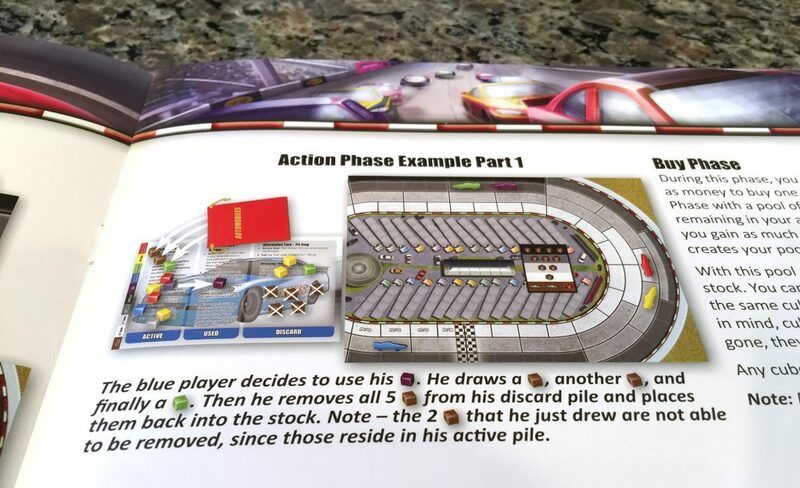 The rulebook is really well laid out with large, easy to read text, and lots of examples. There’s even six other groups of cards suggested by the designer and the publisher once you’re ready to move past the beginner set. Stay tuned for our review of the Racing Season Expansion. I haven’t even talked about the other side of the board which features the Monza track. Honestly, I played with the Daytona track and the default card set my first 4 or 5 games. You could play a dozen or more games without needing to flip the board! But when you do, the game immediately changes because different cards and gear cubes are now more important. I can’t stress enough how great this game is. AEG and designer David Short deserve all the praise they receive for publishing this gem! I predict it remains in my collection for years and years to come! What do you think about Automobiles? Give us your opinions about what you like and/or dislike about the game in the comments below!